Albert (Al) Laezza passed away on September 18, 2017 at home with his family. A Memorial Mass will be held on September 26, 2017 at 11:00am at St. Rita Catholic Church, 14404 14th Street, Dade City Fl. 33523. There will be a reception immediately following the Mass. 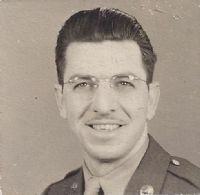 Al was born on April 8, 1922 to the late Edward and Concetta Laezza in Philadelphia, PA. Al was a World War II D-Day June 6th Omaha Beach survivor. He is survived by his daughters; Sandra (David), Patricia (Robin) and sons, Edward (Wanda) and Paul (Maria) along with 8 grandchildren, 10 greatgrandchildren and many nieces and nephews. Al was preceded in death by his wife Frances, brothers; John, Eddie and Joe and Sisters; Mamie and Molly.